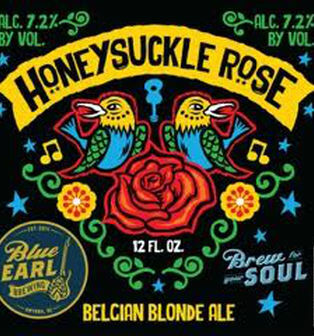 Honeysuckle Rose – Belgian Style Blonde Ale – This beer takes it’s name from “Honeysuckle Rose” a 1929 song composed by Fats Waller with lyrics by Andy Razaf, and inducted in the Grammy Hall of Fame in 1999. A moderate-strength golden ale that has a subtle Belgian complexity, slightly sweet flavors of orange and lemon, and a dry finish. A light and refreshing ale with a very clean character. A sensational Belgian flavor profile that’s assured to satisfy your soul! Grains: Pilsner, Munich, Specialty malts Hops: Hallertauer, Liberty Notes: Orange, Lemon-pepper and Honeysuckle.